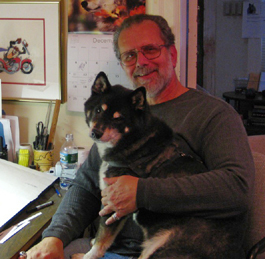 Paul Jamiol has been cartooning for more than 40 years. He has been recognized for his work locally, nationally and internationally. His political cartoons have been featured in multiple newspapers and magazines, and on the Internet. Paul entered the world of editorial cartooning by drawing for one local newspaper (The Watertown Sun in Watertown, MA). He ended up drawing for several regional newspapers every week, commenting on a different issue for each paper. He has won many awards for his vision of the world around us, including several awards from state, regional and national press associations (New England Press Association, Suburban Newspapers of America, Massachusetts Press Association, etc.). Some say Jamiol’s view of the world leans left, but he consistently takes all sides to task. It’s not in the interest of fairness, but more like “if you’re doing something to hurt people, you should be called on it.” Jamiol follows this credo throughout his work. Jamiol’s art, while primarily in the political commentary realm, also includes illustration, graphics, design work, animation and murals. He illustrated and produced a calendar of fine-line pencil drawings for thirteen years, and has also written and illustrated three children’s books. Paul has been behind a pen, pencil or computer for most of his adult life. His love of cartooning and art has given him a chance to speak out and comment – a rare gift which he does not take lightly. He credits Linda, his best friend and love of his life, for giving him the peace of mind and heart to focus on his art, for being a true partner, and for being the one who always takes their projects (like this book) to the highest level.